We are one of Witter Towbars largest customers, we fit 1000's of their towbars every year. We also collaborate and share vehicle information with them, and as such enjoy unrivaled technical support. You can get a price to fit a towbar for your car by entering your reg number and postcode above. Witter also manufacture a comprehensive range of towbar mounted cycle carriers which are availble here. It was his vision that led to the creation of Witter Towbars, the UK's leading towbar manufacturer. Today, thanks to continuous investment, the Witter name is synonymous with the highest standards of design, quality, safety and security for motorists and road users. Fast forward to 2013, and it was time for the original founders to retire and hand over the reigns to a new team. Witter was purchased by Horizon Global, a company head-quartered in Michigan USA, who own many of the worlds largest towing brands such as Hayman Reese, and Bulldog. Their complete range of towing products are designed for today's modern lifestyles - from straightforward towbars to award-winning cycle carriers that provide a practical, safe and easy-fit solution to the problem of transporting bikes on vehicles. We are proud of our innovative approach, which is shaping the direction of towbar design and development throughout Europe. Using the latest 3D CAD systems, their fully qualified engineers design products to fit all major vehicle manufacturers' specified attachment points. 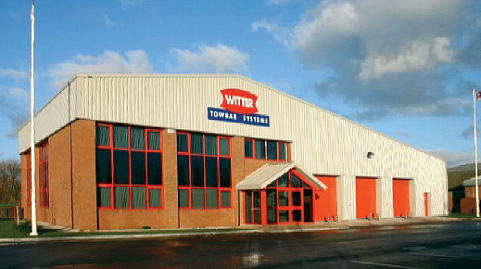 Witter towbars are manufactured from high strength structural steel plate, tube and section material and shaped into components using the very latest production techniques and processes. Every Witter towbar is covered by the Witter Shield of Safety, a symbol of quality, backed by a genuine lifetime guarantee. This is made possible through their continuing investment in skills, technology and quality systems. Witter Towbars are totally committed to quality and have full accreditation as a Quality Assured Company, ensuring that Witter towbars continue to occupy a place at the forefront of engineering excellence.